It is clear by now that Hamas is behind some of the recent terror attacks against Israelis in the West Bank. These attacks serve the interests of Hamas and its friends and sponsors, especially the Palestinian Islamic Jihad organization -- and Iran. Hamas and its allies have a plan, and they are not even keeping it a secret -- to export their "armed struggle" against Israel beyond the Gaza Strip and ultimately to take control of the West Bank. The latest terrorist attack took place on December 9 outside the West Bank settlement of Ofra, east of Ramallah. An Israeli-Canadian citizen, Amichai Ish-Ran, and this pregnant wife, Shira, were among seven people wounded in a drive-by shooting attack. The baby born prematurely as a result of the terrorist attack died on December 12, after doctors fought to save his life for close to 72 hours. Hamas, which later claimed responsibility for the attack, was the first Palestinian faction to commend the terrorists. So far, not a single Palestinian faction has come out against the attack, including Palestinian Authority President Mahmoud Abbas's ruling Fatah faction. Describing the shooting attack as a "heroic and qualitative operation," representatives of Hamas and several Palestinian factions said that it demonstrated that the Palestinian "resistance was still alive in the West Bank." They also called on Palestinians to "step up the intifada (uprising) against Israel, specifically settlers and Israel Defense Forces soldiers. "The West Bank has taken the initiative of resisting the occupation," Hamas said in a statement published in the Gaza Strip shortly after the terrorist attack. The attack, Hamas added, "came to affirm our people's legitimate right to resist the occupation at a time when the occupation, together with Israel, had tried to criminalize our resistance." 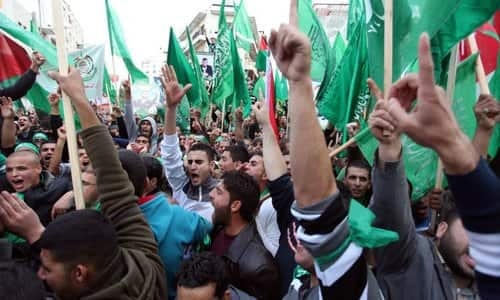 This stance by Hamas points at two important factors; first, that Hamas and its allies are openly working and encouraging the eruption of a new anti-Israel uprising in the West Bank; and, second, that Hamas and its friends have been emboldened by the recent failure of the UN General Assembly to adopt a US-sponsored resolution condemning Hamas and other Palestinian groups for firing rockets at Israel and inciting violence. Hamas's dream of spreading its ideology to all Palestinians is as old as its foundation 31 years ago. Hamas is not interested in ruling only the Gaza Strip. It wants the West Bank, Jerusalem, and all the land, "from the [Jordan] river to the [Mediterranean] sea." Hamas does not believe in negotiations or peaceful settlements. Rather, it believes that the only way to "liberate" Muslim land is through jihad. This goal is why, it says, it remains committed to the option of "armed struggle" against Israel. The Hamas charter, which is relevant today more than ever, states unambiguously that the movement "believes that the land of Palestine is an Islamic Waqf consecrated for future Muslim generations until Judgement Day. It or any part of it, should not be squandered; it, or any part of it, should not be given up. (Article 11). From here, it is easy to understand why Hamas continues to celebrate and applaud every terrorist attack against Israel, whether in the Gaza Strip, the West Bank or inside Israel proper. Hamas sees these "heroic and brave operations" as an implementation of its ideology of waging jihad to "liberate the land of Palestine." Even if the terrorists who carried out the recent shootings in the West Bank do not belong to Hamas, their attacks are completely compatible with Hamas's declared goals and ambitions, the most prominent of which is seeing Israel removed from the map. Hamas has good reason to celebrate not only the attacks, but what it perceives as a series of "achievements" that it has gained in recent weeks. These "achievements" include the $30 million in Qatari cash grants that were delivered to Hamas in the past few weeks so that it can pay salaries and stipends to tens of thousands of its employees and supporters, as well as the failure of the UN General Assembly to adopt the anti-Hamas resolution. These two steps have left Hamas leaders laughing all the way to the next shooting attack on Israel. The Qatari funds are being delivered to Hamas as part of unwritten understandings regarding a cease-fire in the Gaza Strip. The purpose of the funds is to help solve the humanitarian crisis in the Gaza Strip and prevent the eruption of another major military confrontation between Hamas and Israel. Hamas, however, has thus far done nothing to stop the violence, including weekly protests that began last March along the border with Israel. On the contrary, Hamas is now saying -- and there is good reason to believe it -- that the demonstrations will continue. Hamas is also saying the that it was not required to pay any "political price" for a purported ceasefire. The ceasefire understandings between Hamas and Israel, which were reportedly achieved through the mediation of Qatar, Egypt and the UN, are only related to the Gaza Strip, and have nothing to do with the West Bank. Because these understandings are limited to the Gaza Strip, Hamas, believes it has a green light to continue launching and directing terrorist attacks from the West Bank without being accused of violating the ceasefire. The UN, Qatar and Egypt should have demanded that any ceasefire agreement include the West Bank, where Hamas still has several armed cells as well as significant support. The Hamas-engineered attacks are not only a threat to Israeli civilians and soldiers; they also undermine the Western-funded Palestinian Authority of Mahmoud Abbas. Each "successful" attack carried out by Hamas earns it more popularity in the West Bank, at the cost of Abbas and his regime. Evidently, members and friends of Hamas have interpreted the failure to adopt the US resolution as a pass from the UN and the international community to continue their "resistance" against Israel. They perceive the failure of the US administration as a "big achievement" -- one that permits the Palestinians to continue all forms of "resistance" against Israel, including the "armed struggle." It is no coincidence, then, that Hamas has responded to the debacle at the UN General Assembly by pledging to remain committed to an "armed struggle" against Israel. Every dollar and every concession that is being made to Hamas will only increase its appetite to continue its plan to extend its control beyond the Gaza Strip. From Hamas's point of view, its plan has won legitimacy from the UN and important players in the region such as Qatar and Egypt. As long as Hamas feels that it is marching in the right direction, we are likely to see an increase in armed attacks and other forms of violence in the West Bank. Now that Hamas is getting what it wants in the Gaza Strip -- millions of dollars and no war with Israel -- it is seeking to shift its attention to the West Bank, all with the help of its friends in Tehran. This has a twofold goal: to undermine or overthrow Abbas's Palestinian Authority, inflict heavy casualties on Israel, and thwart any peace plan brought forward by the US administration. In other words, Hamas and Iran now have their sights set on the West Bank, and this is reason not only for Israel to worry, but Abbas as well.